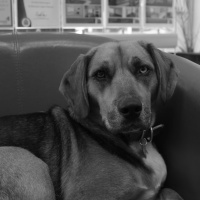 Delilah started with us in 2015 and prides herself on her greeting and customer engagement skills. She particularly likes meeting new people, lounging in her red chair, walks in the Park and chasing squirrels. When things get stressful she is always available to listen to your problems. Will do anything for a biscuit ! !